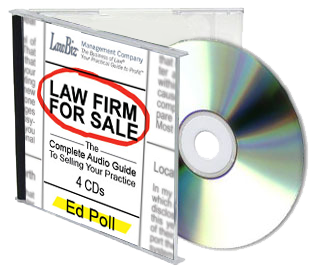 Download our white paper on how to get the best value from selling a law practice. Contact me about selling a law practice. When the American Bar Association modified Model Rule of Professional Conduct 1.17 in 2002 to permit the sale of part of a practice, it was called the savior of solo and small-firm practitioners. The modification gave lawyers another way to reap the financial value of what they have built up over the years by their own hard work and creativity, converting the goodwill represented by their practices into a liquid asset. I am proud to say that I was the catalyst for the ABA Commission on Ethics decision, affirmed by the House of Delegates, to modify Rule 1.17 to allow lawyers to sell a practice area and still remain in practice, although not in the area sold. These lawyers can continue to make valuable contributions. For example, a probate and estate planning lawyer may sell the estate planning segment, but retain the probate segment. That allows the lawyer to work less but still serve clients. Any other course would require selling or closing the entire practice or continuing the practice while serving clients with less vigor because of aging and loss of interest. With a partial practice sale, clients are better served, both those whose estate plans are handled by other lawyers interested in the segment they purchased and those who are probating estates of decedents. The practical focus of Rule 1.17 is the sole and small-firm practitioner. Large firms do not sell their practices; they can break up, merge, combine or move entire practice groups from one firm to another, but they don't â€œsellâ€� their practices â€” or at least they don't call it that â€” and thus sidestep Rule 1.17. Partial practice sale has been adopted by the states that follow the ABA model rules and is slowly being adopted by others as well. But the change has not been adopted uniformly. It was not until 2008 that the New Hampshire bar adopted its own version of Rule 1.17, and in so doing asserted that the selling lawyer cannot continue to practice law in the state of New Hampshire, in effect imposing a covenant not to compete. In 2010, the California bar proposed four pages of changes to its rules on buying and selling a practice that, among other things, would require the selling lawyer to divest all of a practice or field of practice, and to cease engaging in the private practice of law once the sale is complete. Another example: A managing partner in Illinois gave me his interpretation that the recently adopted Illinois model rule requires the sale of the entire practice without allowing for a transition to occur. In other words, when an escrow for the sale closes after notice is given to clients in accord with the rule, the lawyer must stop practicing, period. That permits no transition whereby the selling lawyer can continue to practice under the aegis of the buying lawyer to facilitate the likelihood the existing clients will stay with the buying lawyer, assuring the value of the practice purchased. These developments violate the intent of modified Rule 1.17 and hurt only sole and small-firm practitioners. What could be done if such interpretations are to be found beyond the north-central U.S.? I will consider that in my next column. Are you considering exiting The Business of Law®? Life After Law: What Will You Do with the Next 6,000 Days? Provides career advice on what is necessary and advisable to personally and professionally transition out of the practice. Discover how to value of your practice, set your sale price, evaluate your practice's unique characteristics, negotiate the sale more effectively. 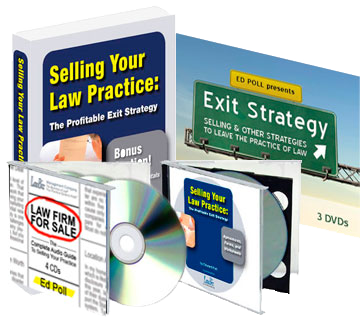 This DVD set reveals insider information that will help you achieve optimal results while transitioning out of the practice of law. Revealing insider information that is sure to go a long way to help achieve optimal results while transitioning out of the practice of law. Learn everything from how to value a law practice, to how to ensure the sale complies with the Rules of Professional Conduct, to negotiation strategies. Ed reveals insider information that helps you get optimal results while transitioning out of the practice of law. A Package Savings of Over $280.00! © Edward Poll & Associates, All Rights Reserved.